Clemens and other school leaders believed that, just as with poverty and racism, students were also held back by a fixed mindset – the belief that one is born smart or not, and that intelligence is a finite quality. It’s the attitude that makes students say things like, “I’ve never been good at writing.” Or, “I’m not a math person.” Clemens knew that if students were asked to up their games, they needed to believe their efforts would pay off. So she introduced a new learning program that seeks to improve students’ confidence about their intelligence. Brainology, the program Clemens implemented, is a curriculum developed by Stanford Psychology Professor Carol Dweck and the company she co-founded, Mindset Works. In 2013, the Raikes Foundation made a grant to the D.C. Public Education Fund to enable D.C. middle schools to begin using the Brainology program to help improve students’ motivation and ability to learn. Dweck pioneered the concept of academic mindsets after conducting research that showed that, with thoughtful interventions, students can turn fixed mindsets into growth mindsets. With growth mindsets, students have the conviction that the harder they work, the more their intelligence will grow. Dweck and her colleagues found that when students know they can develop their abilities, they seek out tougher challenges, make greater effort, persist longer at tasks, and achieve at higher levels. In one study, growth mindsets showed a correlation with higher motivation and academic performance for middle-school math students. In another, students who received Brainology training showed marked increases in reading ability and greater resilience in the face of setbacks. And in a study of California middle-schoolers, Brainology was correlated with significantly higher grade-point averages among Latino students, as well as better conduct among students with previous behavior problems. 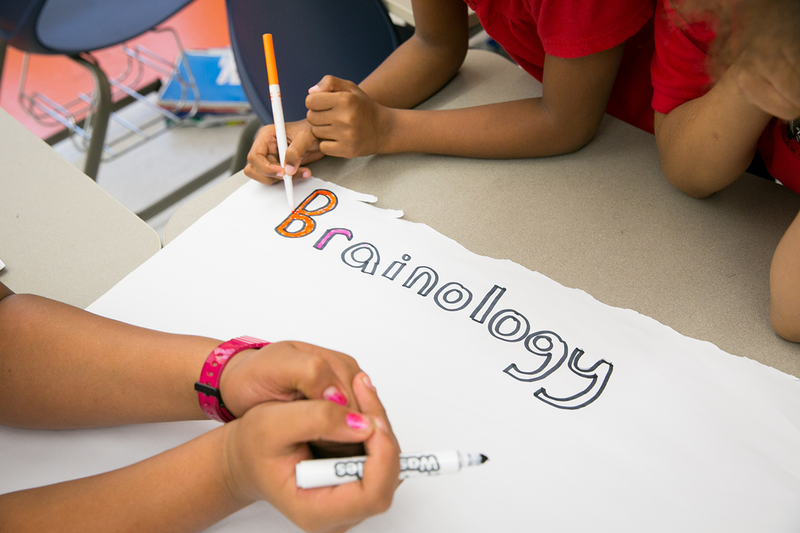 In the District of Columbia Public Schools (DCPS), 15 middle schools offer Brainology to nearly 400 students. Nationally, about 500 schools have adopted Brainology, incorporating it into an existing class or as a standalone class taught by experienced teachers—teachers like Douglas Creef at Stuart-Hobson Middle School. On a fall afternoon, Creef’s Brainology class is analyzing a complex text that explains the difference between talent and achievement—a distinction crucial to developing a growth mindset. The room is papered with inspirational messages and maps of the brain. Folders are packed with students’ reflections on their frustrations, successes and perceived limitations. As the weeks go on, the students demonstrate a growing confidence in their abilities and increased willingness to work harder to reach their goals. DCPS is collecting the data needed to formally evaluate Brainology. But teachers at Stuart-Hobson have already noticed some interesting trends among students taking the course. Second, the teachers noticed big changes in a particular set of test scores. Reading growth at Stuart-Hobson, as measured by standardized tests, had been averaging about 100 points a year. Last year, in the eighth grade, the jump was 110; in the sixth grade, the increase was nearly 200 points; and in seventh grade, reading scores rose by a remarkable 400 points. What caused the dramatic rise? Clemens and her staff believe it was, in large part, the result of Brainology. In order for growth mindsets to really take hold, they must be embedded in all classes and ingrained in the culture of the whole school, says Eduardo Briceno, co-founder of Mindset Works. “It can’t be just a packaged program,” he said. In essence, educators themselves must embrace a growth mindset, too—something people like Clemens and Creef have demonstrated can pay dividends in even the toughest academic settings.